This past Saturday our home smelled like chocolate chip cookies ALL DAY LONG! Doesn’t sound so bad, right? It all started when I promised a friend that I would make a batch of our Chocolate-Covered Cookie Dough Bites for a bridal shower she was throwing. Not a problem! Sure, the treats are a bit time consuming to make, but they’re delicious and well worth the work. The trick was making them AND whipping up another dessert for a Super Bowl party that we’d be attending on Sunday. I already had all of the ingredients for the cookie dough out—butter, flour, etc.—so I thought, why not just make another chocolate chip dessert? 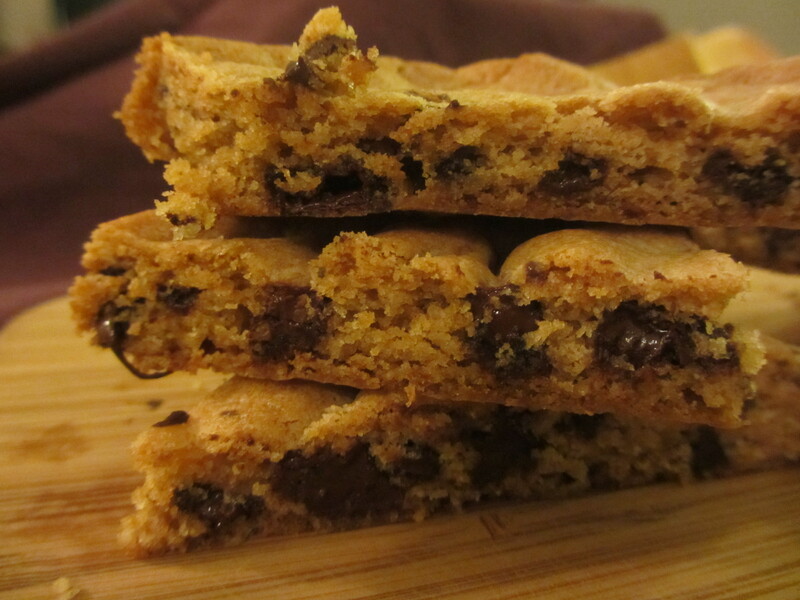 I started out with a basic chocolate chip cookie recipe but then got a crazy idea when it came time to plop the dough onto the cookie sheet: Why not cover the entire sheet with dough! I did, and the end result was magical. 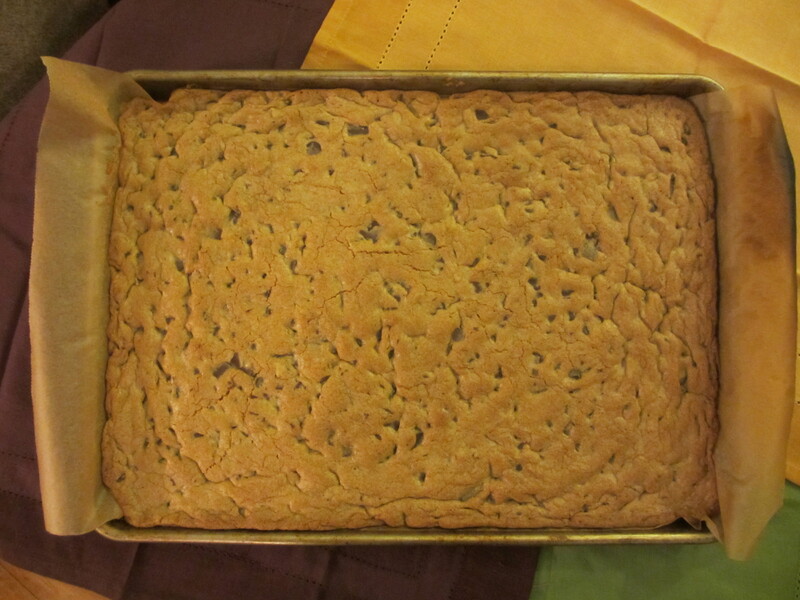 The dough filled an entire quarter sheet pan (roughly 13 x 18 inches) and tasted way better than those cookie cakes you can usually find at your local mall. After all, this one was homemade! 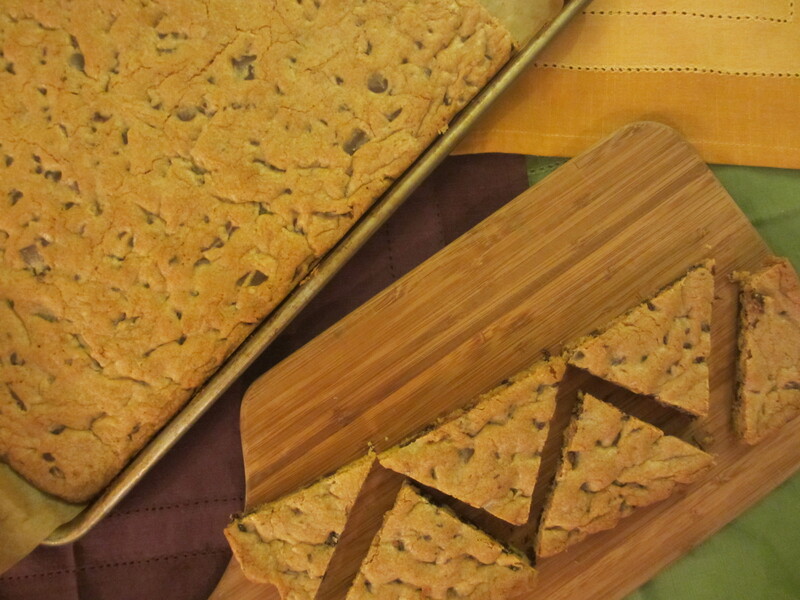 We ended up cutting the oversized treat into individual servings before transporting it to the party, but it would have been equally as great to present it as one GIANT cookie. Heck, throw some candles in and it would make an excellent birthday “cake” for someone looking for something a bit different. 1. Preheat oven to 350°F. Line a baking sheet with parchment paper and set aside. 2. In a large bowl or in a stand mixer, cream together the butter, brown sugar and sugar. Mix for 2 to 3 minutes or until fluffy. Add in the eggs, one at a time, and mix to combine after each one. Mix in the vanilla extract. 3. In a medium bowl, combine the flour, salt, baking soda and baking powder. Add dry ingredients to the wet in two batches, mixing until completely combined each time. Fold in the chocolate pieces and both types of chocolate chips. 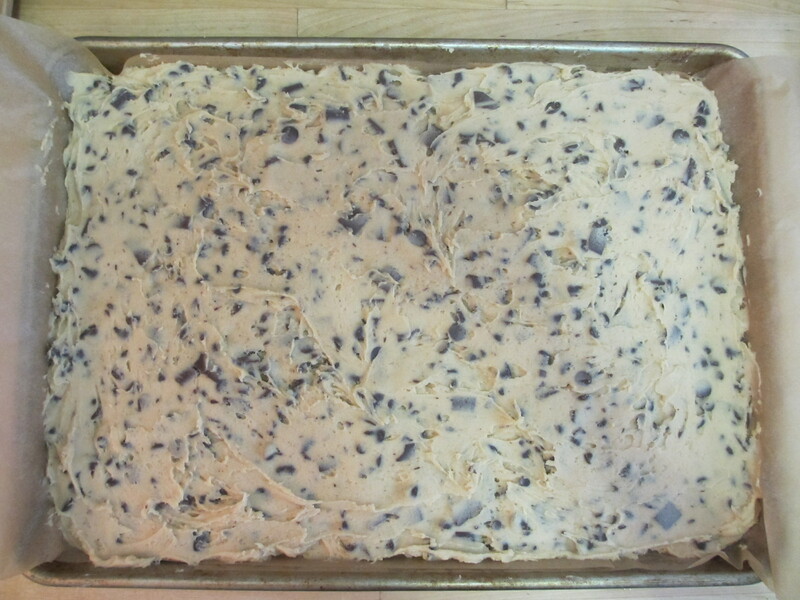 Spread dough in an even layer on prepared baking sheet and bake for 25 to 30 minutes until cookie is golden brown and set. Remove from oven, let cool in pan on a rack. SWWU Tip 1: You’re going to have to stretch the batter out pretty thin to cover the entire pan. Don’t worry, it will puff up when you bake it. Just make sure the entire pan is covered and don’t leave any holes behind. SWWU Tip 2: Don’t have multiple types of chocolate and chocolate chips on hand? No worries, you can use any combo to dress up this dessert. This entry was posted in In the Kitchen and tagged @SWWUblog, birthday, cake alternative, chocolate chip, cookie, crowd, dessert, guilty pleasures, holiday desserts, in the kitchen, milk and cookies, party, super bowl by Something We Whipped Up. Bookmark the permalink.